May 2018 www.coalage.com 41 operating ideas continued New Limitations The 2017 act imposes some new restric- tions on prior-law deductions and elimi- nates some others. Some relevant changes for mining companies and downstream operations include: • Interest expense. The act limits the deductibility of interest expense to the sum of business interest income, 30% of the business's adjusted tax- able income, and floor plan financing interest. • Net operating losses (NOLs). 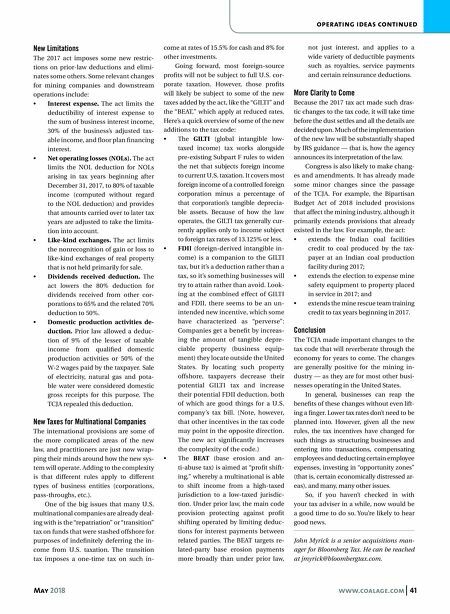 The act limits the NOL deduction for NOLs arising in tax years beginning after December 31, 2017, to 80% of taxable income (computed without regard to the NOL deduction) and provides that amounts carried over to later tax years are adjusted to take the limita- tion into account. • Like-kind exchanges. The act limits the nonrecognition of gain or loss to like-kind exchanges of real property that is not held primarily for sale. • Dividends received deduction. The act lowers the 80% deduction for dividends received from other cor- porations to 65% and the related 70% deduction to 50%. • Domestic production activities de- duction. Prior law allowed a deduc- tion of 9% of the lesser of taxable income from qualified domestic production activities or 50% of the W-2 wages paid by the taxpayer. Sale of electricity, natural gas and pota- ble water were considered domestic gross receipts for this purpose. The TCJA repealed this deduction. New Taxes for Multinational Companies The international provisions are some of the more complicated areas of the new law, and practitioners are just now wrap- ping their minds around how the new sys- tem will operate. Adding to the complexity is that different rules apply to different types of business entities (corporations, pass-throughs, etc.). One of the big issues that many U.S. multinational companies are already deal- ing with is the "repatriation" or "transition" tax on funds that were stashed offshore for purposes of indefinitely deferring the in- come from U.S. taxation. The transition tax imposes a one-time tax on such in- come at rates of 15.5% for cash and 8% for other investments. Going forward, most foreign-source profits will not be subject to full U.S. cor- porate taxation. However, those profits will likely be subject to some of the new taxes added by the act, like the "GILTI" and the "BEAT," which apply at reduced rates. Here's a quick overview of some of the new additions to the tax code: • The GILTI (global intangible low- taxed income) tax works alongside pre-existing Subpart F rules to widen the net that subjects foreign income to current U.S. taxation. It covers most foreign income of a controlled foreign corporation minus a percentage of that corporation's tangible deprecia- ble assets. Because of how the law operates, the GILTI tax generally cur- rently applies only to income subject to foreign tax rates of 13.125% or less. • FDII (foreign-derived intangible in- come) is a companion to the GILTI tax, but it's a deduction rather than a tax, so it's something businesses will try to attain rather than avoid. Look- ing at the combined effect of GILTI and FDII, there seems to be an un- intended new incentive, which some have characterized as "perverse": Companies get a benefit by increas- ing the amount of tangible depre- ciable property (business equip- ment) they locate outside the United States. By locating such property offshore, taxpayers decrease their potential GILTI tax and increase their potential FDII deduction, both of which are good things for a U.S. company's tax bill. (Note, however, that other incentives in the tax code may point in the opposite direction. The new act significantly increases the complexity of the code.) 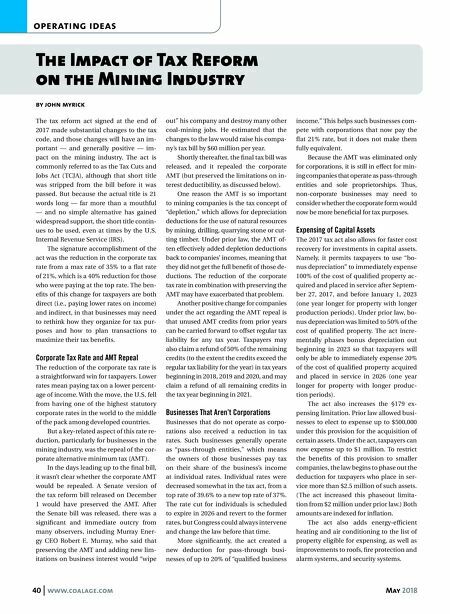 • The BEAT (base erosion and an- ti-abuse tax) is aimed at "profit shift- ing," whereby a multinational is able to shift income from a high-taxed jurisdiction to a low-taxed jurisdic- tion. Under prior law, the main code provision protecting against profit shifting operated by limiting deduc- tions for interest payments between related parties. The BEAT targets re- lated-party base erosion payments more broadly than under prior law, not just interest, and applies to a wide variety of deductible payments such as royalties, service payments and certain reinsurance deductions. More Clarity to Come Because the 2017 tax act made such dras- tic changes to the tax code, it will take time before the dust settles and all the details are decided upon. Much of the implementation of the new law will be substantially shaped by IRS guidance — that is, how the agency announces its interpretation of the law. Congress is also likely to make chang- es and amendments. It has already made some minor changes since the passage of the TCJA. For example, the Bipartisan Budget Act of 2018 included provisions that affect the mining industry, although it primarily extends provisions that already existed in the law. For example, the act: • extends the Indian coal facilities credit to coal produced by the tax- payer at an Indian coal production facility during 2017; • extends the election to expense mine safety equipment to property placed in service in 2017; and • extends the mine rescue team training credit to tax years beginning in 2017. Conclusion The TCJA made important changes to the tax code that will reverberate through the economy for years to come. The changes are generally positive for the mining in- dustry — as they are for most other busi- nesses operating in the United States. In general, businesses can reap the benefits of these changes without even lift- ing a finger. Lower tax rates don't need to be planned into. However, given all the new rules, the tax incentives have changed for such things as structuring businesses and entering into transactions, compensating employees and deducting certain employee expenses, investing in "opportunity zones" (that is, certain economically distressed ar- eas), and many, many other issues. So, if you haven't checked in with your tax adviser in a while, now would be a good time to do so. You're likely to hear good news. John Myrick is a senior acquisitions man- ager for Bloomberg Tax. He can be reached at jmyrick@bloombergtax.com.